Bonnie and Bailey have been friends since puppyhood - when they were both 5 months old. 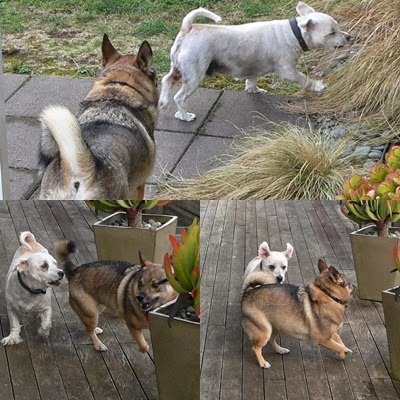 Four and a half years on, they still love each other’s company - playing and romping together happily and often talk to each other through the fence. Bailey belongs to our neighbour, Babara. Barbara and I talk over the fence from time to time so I guess they copy us - not over the fence but through the fence where there are gaps wide enough that they can see and hear each other.